Use pillars of power analysis tool to identify the institutions without whose support your target would collapse. It helps you strategize ways to weaken or remove those institutional “pillars,” so that the foundation that sustains the target begins to crumble and the system falls. Once you understand the various institutions that enable a specific oppressive regime or status quo situation to maintain its power, you can investigate how to neutralize, undermine, or withdraw the foundations that the oppressive system depends on, and reduce its power. 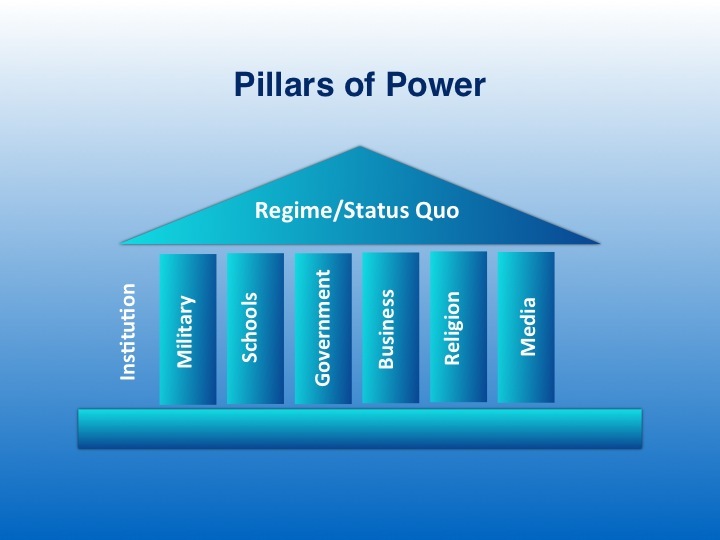 Some of these pillars, such as the military, the police, and the courts, are coercive in nature, compelling obedience through force or the threat of force, while other pillars, like the media, the education system, and religious institutions, support the system through their influence over culture and popular opinion. Hence, the power of even the most charismatic or ruthless leader is contingent upon the support of key institutions, themselves vulnerable to popular action or withdrawal of consent from the general population. Identify the “pillars” that constitute the institutions that support the target (educational institutions, the media, the military, corporations, etc.). Start generally, but refine and specify as much as you can about each pillar. For example, if you identify the police or the military as a major pillar generally, then sub-labelling them more specifically “Capitol District Police” or “President’s Special Forces” will give you a more precise picture of the issue and a better framework for strategic planning. Take a moment to identify which pillars are most critical to holding up the system. Perhaps some pillars are bigger than others in your drawing, representing the relative strength of one institution in supporting the system to another lesser institution. Then, compare and identify your ability to impact or reach whomever makes up the pillars that are both critical to the system and vulnerable to your impact. These are the places where your campaign has great potential. One way to determine where you may have the most potential to impact the strength of a pillar is by analysing the internal construction of each pillar. Start by drawing a circle that represents a cross section of the pillar, with concentric circles that you can label with the individuals or groups that compose the pillar itself. 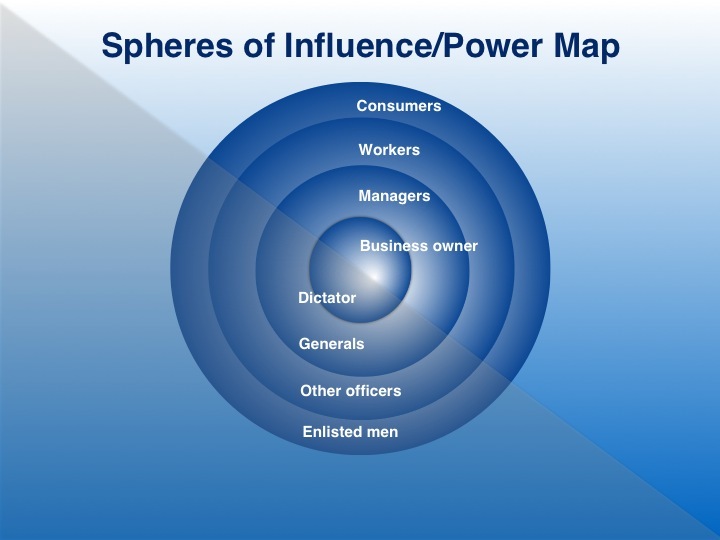 Be specific about elements of the support structures, with the center being the most impacted or powerful (the dictator or general might be in the center of the military pillar, with other leadership in the next circle, then regular troops, then veterans, military families, etc.). As you move out from the center, the power the groups or individuals hold changes, and their connection or loyalty to the institution often diminishes. This will help you visually assess where you could have the most impact on a pillar, and which constituencies you may be able to reach as you try to break down support for the system. Now, use this big picture analysis with a more in depth/detailed strategic planning tool such as spectrum of allies, which identifies the relative resource cost of moving specific constituencies. There is often a benefit to using more than one tool at a time, helping to identify missing pieces and bringing in a specificity that will help to create a more effective strategic plan. This tool is great for starting out with people power strategic planning, and will develop a big picture overview of the vulnerability and strengths of the system you are fighting. But don’t mistake this for a detailed road map for your campaign — follow up this tool with others mentioned in the “How To Use” section. And, as in real life, if you end up pushing the pillars of support in towards the center rather than pulling them away, the roof will not come down. Take this into account when determining which pillars, and how, you will target them in your campaign.